Once settled on your site there is lots to do and see before the start of the race. The final qualifying sessions take place on Thursday night. This is a good opportunity to try some of the good viewing points around the circuit (link to circuit plan). Friday is an open pits day. You are free to walk through the pits and view all the entrants in different states of preparation for the start of the race. 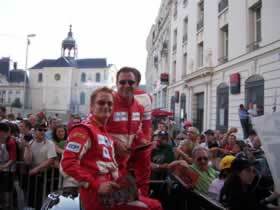 In the evening the centre of Le Mans hosts the drivers parade (usually starts about 6pm). Here you will be able to see all the “pilotes” of the race entries. You can also join the tens of thousands of fans enjoying the local bars and restaurants. Getting from the circuit to the town centre can be a challenge due to the large number of enthusiasts looking to make their way to the centre of Le Mans. 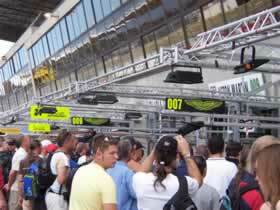 By the main entrance of the circuit there is a taxi rank and buses that will take you to the town. Be warned these are always very busy and the buses will be crowded. We have taken the train from the nearby village of Arnage. It is a good three mile walk to the station, but a worthwhile alternative to the bus. For train times click here (Sncf.fr for link to timetable). Also there is a bar located less than five minutes from the station. Having arrived at Le Mans train station the main square is only a ten minute walk away. For the early risers there is warm up on Saturday morning, with the race starting at 15:00hrs. The build up of the race starts around 12:00hrs, with fans taking up the best positions in the general areas around the track. There are grandstands along all of the start finish straight, above the pits and at several other key positions around the circuit (add link to circuit plan). If you have purchased a grandstand seat, you can leave and return to your seat with ease. During the pre race build up all the drivers are introduced to the crowd, national anthems are played for all the countries the drivers represent. As 3 o’clock approaches the excitement builds and the cars leave the pits to form up along the start finish straight. The cars then leave one by one to form up on their grid positions ready for the parade lap. Just before 4 o’clock the cars are given the green flag and set off on the formation lap behind the safety car. When they reach the start finish straight the roar of the engines and the crowd is deafening, the race has begun. During the race there are many good places to watch the race from; the start finish straight, with the pits opposite; Dunlop Chicane; Tertre Rouge and Maison Blanche are all within easy walking distance. There is also Porsche Curve, Arnage and Mulsanne around the circuit. Last year saw many incidents in the closing hours of the race at Indiannapolis and Arnage. 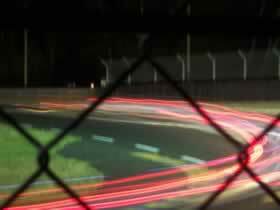 Watching the race at night is a great spectacle, with the fluorescent signage, brake discs glowing and flames from the exhausts. At the campsites there are usually music and fireworks late into the night. Radio Le Mans is a good way of keeping up to date with race progress as you walk round the circuit. Also there is the “Village” on the inside of the circuit with bars, trade stands and displays by most of the major competitors. As 15:00hrs approaches on Sunday afternoon we usually try and head back to the start finish straight for the final minutes of the race. After the race has ended it is possible to cross the track and be part of the podium celebrations. Above all enjoy yourself, it is without a doubt the greatest spectator experience of any motor racing event in the world.